After a well deserved break, footballers return to the grind in the form of pre-season and are subjected to tough yet scientifically designed methods tailored to get them back up to speed sooner rather than later. The focus is on what many perceive to be the unglamorous side of the game with fitness the priority. In the recent past another aspect has made its way into the pre-season plans of clubs around the world. Over the years, the game has undergone a transformation with widespread commercialization the norm especially for the big teams. The “brand” associated with a football club is assiduously maintained and nurtured. The likes of Manchester United and Real Madrid are instantly recognizable names around the world and it comes as little surprise that the clubs do everything to reap the sizable rewards associated with it. They would be foolish to not do so. The pre-season period provides a perfect opportunity for the clubs to tap into their global fan base by the way of high profile friendlies against other powerhouses or against local teams from the country being visited. Asia and the USA remain favourites for many of the teams as the players go about readying themselves for the rigors of the upcoming season alongside the customary fan interaction and commitments to the club sponsors. The question is whether the preparations for the upcoming season are adversely affected by this current format. Would teams be better served training in home conditions rather than travelling across half the world? Or is pre-season a necessary evil wherein the financial implications outweigh any potential negatives? After all, if it did have a markedly adverse effect, then the clubs would just stop doing it right? 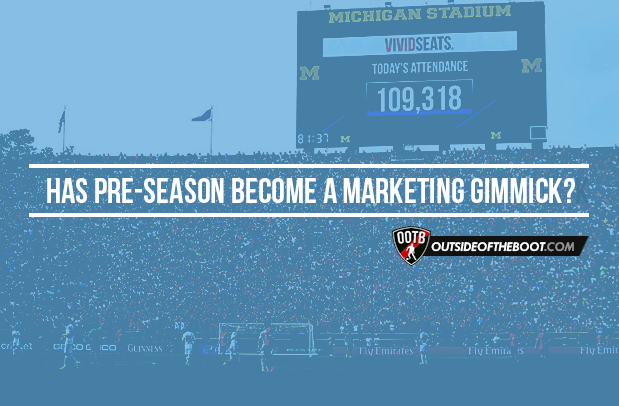 DEBATE: Has pre-season become a marketing gimmick for football clubs and would they be better off training back home? Share your thoughts! We posed the question to our Twitter followers and were greeted with plenty of interesting viewpoints! @OOTB_football Well for big clubs it is a pretty huge opportunity to sell a lot of jerseys in Asia, North America & whatnot. @OOTB_football why spend time travelling when you could be playing/training? @OOTB_football also it hurts the local leagues, because will no longer want to watch inferior quality football..
@OOTB_football I think they are useful in expanding fan base but shouldn’t happen every year due to impact on pre-season. @OOTB_football yes but marketing is a key factor of the success of football club in today’s age therefore … It’s a dilemma. Have something to say? Join the debate by leaving your comment below.